Is there funding available for students to attend? Will materials be sent to me before the class? I am coming from outside the U.S. and need a letter to help me obtain a visa. Will I need my computer for the course and, if so, any programs, i.e., Stata? Can you please give me more information on the Stata session on Sunday? What kind of background knowledge do you expect? Will there be parking available on campus? What is the location of the training and how far are the hotels from this site? We have no funding available to support attendees. The proceeds from this short course are used to help support our graduate students. In future years, this course may be offered in different locations or in conjunction with a national or international meeting and if/when we do, it will be advertised extensively. Approximately a week before the course starts, a zipped file of the slides will be emailed to all the participants. Please send your name and full mailing address to estimate@econ.msu.edu and a letter will be emailed to you. Please specify if you also need a hard copy. Note that we do not have an official University stamp (or certified copy) available for sending. Because of the condensed timeframe for this course, it is taught strictly in the form of lectures and copies of all course slides are provided. Some attendees bring computers so they can view the slides on them or so that they can test out some of the knowledge learned in the evening but there is no hands-on time available during the course itself. The session allows the professors to delve into some more practical issues that may get glossed over during the lectures - such as including interactions in models with endogenous explanatory variables. In 2016, a couple of Stata commands for models that were not really covered in lecture (such as generalized estimating equations for count and fractional data) were illustrated. All are welcome to attend ÊSTIMATE. However, to fully benefit from the workshop, we recommend that participants have an econometrics background comparable to a first-year PhD econometrics sequence. By way of example, the topics covered in the first year econometrics sequence at MSU (EC820A, EC820B) include: Statistical tools for econometrics. Applications of statistical tools, including probability distributions, estimation, hypothesis testing, asymptotic theory and maximum likelihood to econometric problems. The single equation regression model. Properties of least-squares estimators under various specifications. Multicollinearity, generalized least-squares, errors in variables, seemingly unrelated regressions. Identification and estimation in simultaneous equations models. For Friday, anyone wanting to park on campus will need to stop at the Police and Public Safety Building located at Trowbridge and Red Cedar. It opens at 7:30 a.m. An all-day pass is $6.00. The three nearest visitor lots are shown in the map below but the one on Shaw lane near the Int’l Center is metered and it’s $1.60 an hour and the meters have to be paid every few hours. 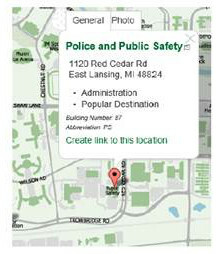 If you have trouble finding either the visitor booth or the Public Safety office, you can call the parking office in Public Safety at 517.355.8440 for directions. If you do purchase a pass, do not park at a meter in a visitor lot or you can be ticketed. On Saturday and Sunday, parking on campus is free. Just be careful not to park in a spot marked handicap or in a leased spot that is not specifically marked as Monday-Friday, 8:00-6:00. No, meals are not included in the registration price. However, bagels and fruit will be available in the morning. The course is being taught at Erickson Hall (620 Farm Lane, East Lansing, MI 48824) in the large room on the north side of the building (nearest the river) called the “Kiva,” Room 103 Erickson. There are a number of hotels within walking distance. Some offer shuttle service but you would need to contact the hotel directly. To get to The Gallery from workshop, go north on Farm Lane to the first traffic light and then turn east (right) onto Auditorium. Approximately one block later, when you reach Physics Road, curve to the left and go north and Phillips/Snyder will be just a short walk north and on your right. 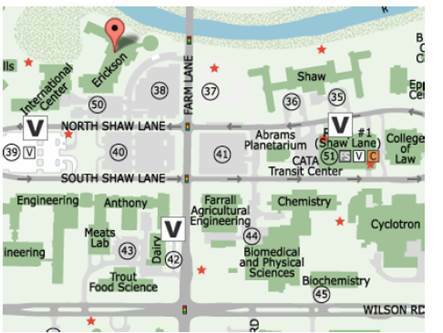 If you’re staying at the Kellogg Center, there is another campus location with a similar set-up across the street (Harrison) in the Brody Complex. It’s called “Brody Square”. Food is also served 7:00a until midnight, 7 days a week. Just west of Erickson, there is a food court in the International Center (located in the back of that building). Most of the restaurants there are closed on Saturday and Sunday but the they are all open until 5:00 on Friday. More information can be found at: http://eatatstate.com/retaildining/crossroads There is a textbook/gift store in the basement of the international center.